You are currently browsing the tag archive for the ‘geometric series’ tag. This is a very famous paradox from the Greek philosopher Zeno – who argued that a runner (Achilles) who constantly halved the distance between himself and a tortoise would never actually catch the tortoise. The video above explains the concept. There are two slightly different versions to this paradox. 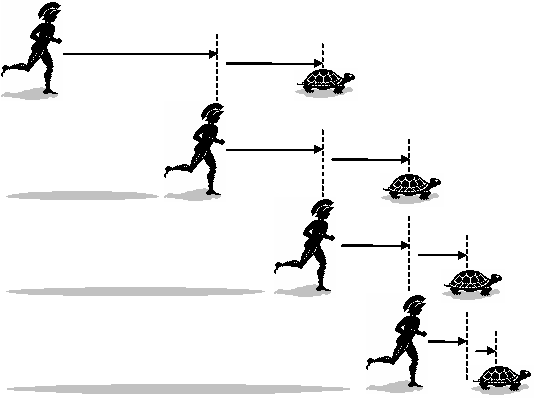 The first version has the tortoise as stationary, and Achilles as constantly halving the distance, but never reaching the tortoise (technically this is called the dichotomy paradox). The second version is where Achilles always manages to run to the point where the tortoise was previously, but by the time he reaches that point the tortoise has moved a little bit further away. 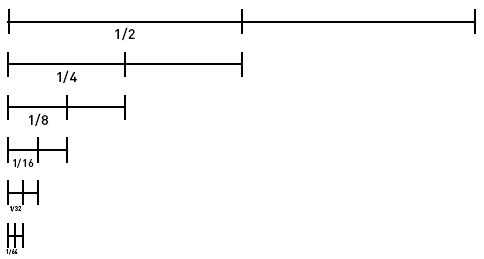 This shows that the summation does in fact converge – and so Achilles would actually reach the tortoise that remained 2 metres away. There is still however something of a sleight of hand being employed here however – given an infinite length of time we have shown that Achilles would reach the tortoise, but what about reaching the tortoise in a finite length of time? Well, as the distances get ever smaller, the time required to traverse them also gets ever closer to zero, so we can say that as the distance converges to 2 metres, the time taken will also converge to a finite number. Here we notice that in doing S – 0.5S all the terms will cancel out except the first one. The second version also makes use of geometric series. If we say that the tortoise has been given a 10 m head start, and that whilst the tortoise runs at 1 m/s, Achilles runs at 10 m/s, we can try to calculate when Achilles would catch the tortoise. So in the first instance, Achilles runs to where the tortoise was (10 metres away). But because the tortoise runs at 1/10th the speed of Achilles, he is now a further 1m away. So, in the second instance, Achilles now runs to where the tortoise now is (a further 1 metre). But the tortoise has now moved 0.1 metres further away. And so on to infinity. So, again we can show that because this geometric series converges to a finite value (11.11), then after a finite time Achilles will indeed catch the tortoise (11.11m away from where Achilles started from). We often think of mathematics and philosophy as completely distinct subjects – one based on empirical measurement, the other on thought processes – but back in the day of the Greeks there was no such distinction. The resolution of Zeno’s paradox by use of calculus and limits to infinity some 2000 years after it was first posed is a nice reminder of the power of mathematics in solving problems across a wide range of disciplines. The chess board problem is nothing to do with Zeno (it was first recorded about 1000 years ago) but is nevertheless another interesting example of the power of geometric series. It is explained in the video above. If I put 1 grain of rice on the first square of a chess board, 2 grains of rice on the second square, 4 grains on the third square, how much rice in total will be on the chess board by the time I finish the 64th square? This is such a large number that, if stretched from end to end the rice would reach all the way to the star Alpha Centura and back 2 times.